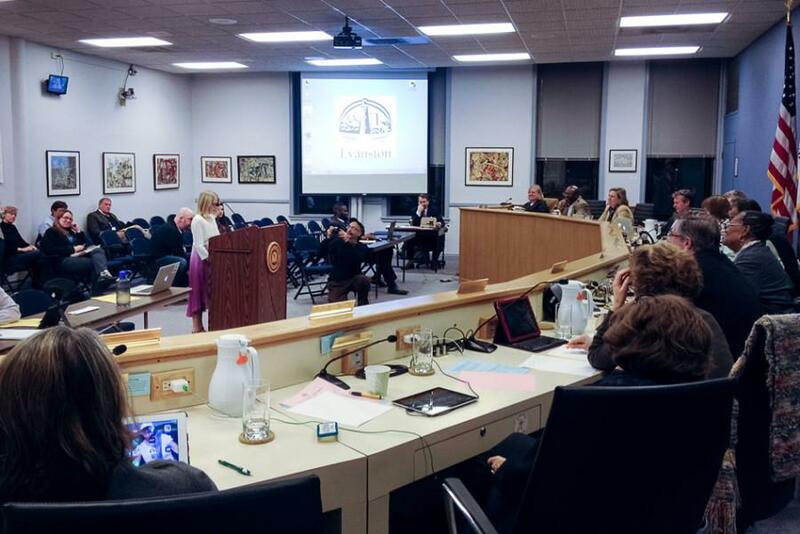 Katie Young, a student at Lincolnwood Elementary School, speaks about Penny Park to Evanston City Council. Young submitted a petition signed by classmates calling for the park not to get demolished. Evanston City Council on Monday voted unanimously to pass the decision on how to approach the Penny Park redesign project to the city’s Parks and Recreation Board. The board will determine how to address current playground conditions, compliance with Americans with Disabilities Act safety standards, budgeting, plans for rebuilding specifications and the possible addition of restrooms and a pavilion. Aldermen emphasized the value of community input on the project and commended those who have worked on the project for cooperating with local voices thus far. The redesign plan has received opposition from members in the community who hope the changes do not alter the all-wooden layout of the park, said Lauren Barski, who operates the website Preserve Penny Park, a group that advocates for the original layout. During the meeting at the Civic Center, Barski presented a petition with 2,300 signatures calling for the preservation of the park’s design. She was joined by Katie Young, a Lincolnwood Elementary School fifth grader, who submitted a petition signed by classmates. Ald. Peter Braithwaite (2nd) spoke to the progress of the project and clarified that the city’s plans with design firm Leathers & Associates, the original park’s designer, are still in the pre-design phase. The park was originally designed more than 20 years ago as a product of community collaboration, Evanston resident George Rieger said. Community members advocated for a park and organized the funding, donated materials and eventually supplied the labor, with over 2,800 people contributing to the construction. Redesign plans began over concerns of the park’s aging infrastructure and its accessibility to people with disabilities. Ald. Mark Tendam (6th) motioned to send the issue to the Parks and Recreation Board to have it review the entire process of the Penny Park redesign, including how to establish or work with a steering committee made up of community members. The council also discussed potentially regulating ride-hailing services such as Uber, Sidecar and Lyft. The Council voted to draft a resolution to recognize state regulations that now apply to Evanston. Correction: An earlier version of this article misstated which school Katie Young attends. She attends Lincolnwood Elementary School. An earlier version of this article also misrepresented the council’s action Monday. Aldermen passed a resolution to recognize recently passed state regulations that will apply to Evanston. The Daily regrets the errors.